LED lighting is cheaper than ever and looks great. LED lighting used to be a far more expensive alternative to traditional incandescent light, but that is not the case any longer. LED lighting is more efficient and safer for the environment, and it looks great! The fixtures themselves cost a little more, but the money you save over time will more than make up for the difference! Retro and industrial style fixtures are back. Big fixtures with metal finishes are all the rage right now and can enhance the look of your home. You can often find fixtures to refurbish that have intricate details and unique features that make them look more like works of art than lighting fixtures. They work particularly well in kitchen and dining areas. Don’t forget the Edison bulbs. 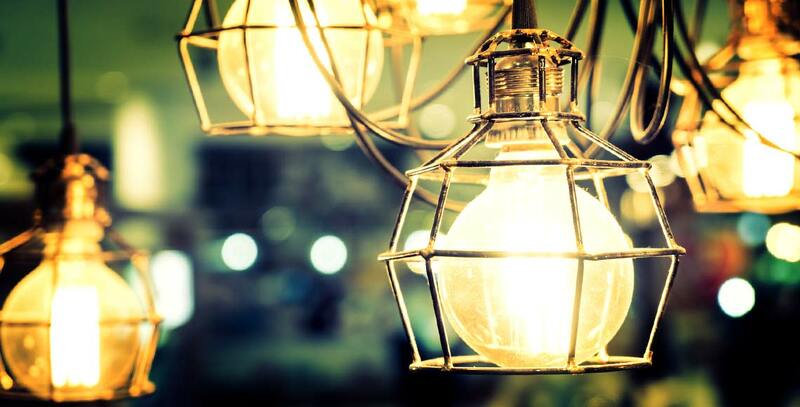 If you really want to complete the retro-look, Edison bulbs complement your fixture. You can also get LED versions of the classic style if you are looking to complete the look. These bulbs are great for adding warmth and a soft beauty to your lighting. When it comes to large spaces in your house, go big or go, well, home. Large pendant fixtures are great over islands, tables, in the foyer, and so on and can become a focal point for the décor of your room. Need help getting your home ready for new lighting? Contact Blue Collar Electricians to ensure that your home is wired for the capacity your new features will need, and let us get your home ready for a change to LED.